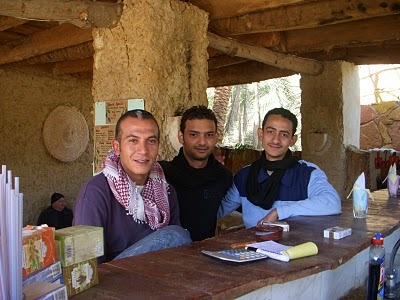 Tanta Waa Cafe – Siwa. 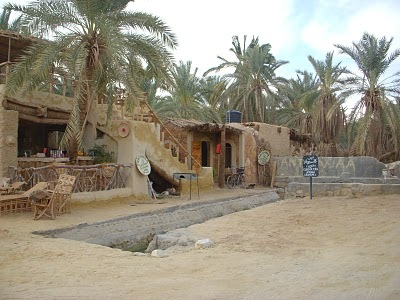 The best place to hang out in Siwa is the Tanta Waa Cafe and restaurant at the Cleopatra spring. I met lots of tourists here, Western and Egyptian. The owner, who is on the left is from Alex, who also owns a very nice garden farm. His helpers are also Egyptian. I can call him at anytime if I need a translator. These guys are the coolest guys in town. The pizza is the best. I had a lemon, mint, and honey drink each time I was there. 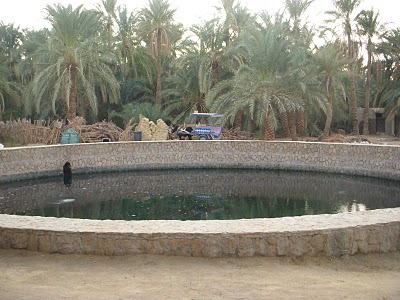 This was my main hang out place. From the house I rented the walk was only five minutes. Here is Goma sitting at the counter. Notice the hammock on the left hand side of the picture. 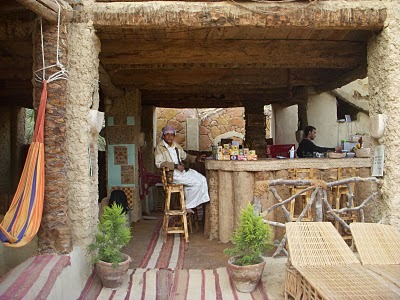 Notice the furniture to the left, the only type of chairs in Siwa. 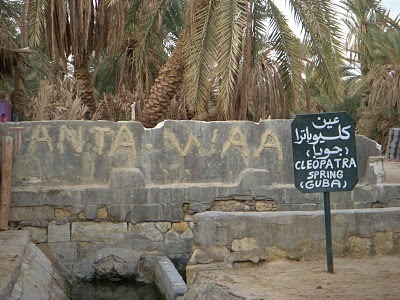 This is the Cleopatra Spring, which is said that Alexander the Great took a dip in when he visited Siwa. Women should be covered when swimming. I guess a couple of girls went in the bathing suits one time. The whole town of Siwaian men came out in the truck loads. LOL, I guess they were all on their cell phones calling each other. They do a great dinner BBQ. You can order lamb, goat, or camel. Three tasty salads with rice. They only use candle light to lighten the whole cafe. 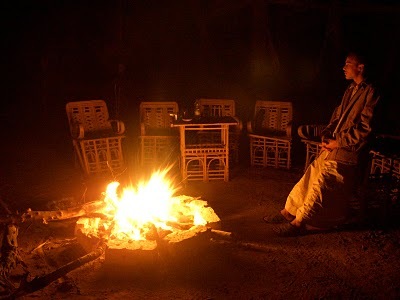 Here is the deaf guy sitting at the fire. 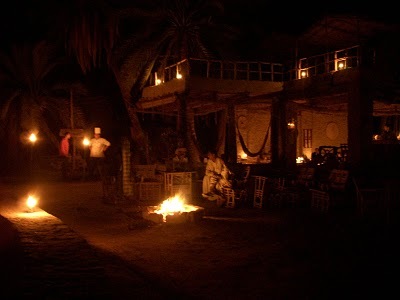 This is a place to not miss, and a person should take some time for relaxation and have a dinner out there. Notice the chef with the big top white hat cooking up the BBQ. It was a good time I met a bunch of girls from Australia on a tour. I will never forget their expression when I was sharing my experience about getting to know the culture and people. Although a tour works for some people. They see this and that and then head out. It is based on what you see and where you stay and eat. I guess I wouldn’t mind being a tour guide someday. This place was the best place to hang out for me. The guys also play a lot of western music. 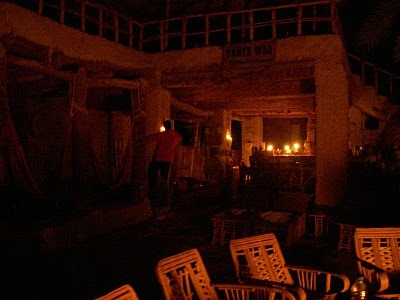 I've been at Tanta Waa cafe at the end of september 2009 with some friends of mine and we've spent an incredible moment. i would like to send some pictures to Walid but his address on his card (wiloalex@yahoo.com), doesn't work. If you have an alternative address, i would be grateful. If not, i will have to go back there :-). Yeah Sam, I don't have his contact information, but if you do go back you can say hi to them for me if you like. Tell him I am in Bulgaria. Next post: The Second Arrival – Cairo. Previous post: Some Sights – Alex.